Put three or four shapes out of construction paper on a brightly colored paper. Place the papers in a sunny window. After several days, let the children remove the shapes from their papers to reveal the non faded areas under the shapes. Let the children outline the non faded areas with glue and sprinkle on glitter. « A snap shot of each child's face (if possible). Directions: Hang mural paper along the wall. Paint grass and flower stems and, with a marker, draw a few ants, worms, and snakes. Cut out a flower shape (about the size of a coffee cup saucer) and let the children decorate it however they wish. Next, cut out a small picture of each child and place their face in the center of the flower and attach it to the wall on the flower stems. Now, the children take markers and decorate coffee filters. Teachers lightly spray the filters to make a tie dye effect. Pinch the filters in the center and slide into a clothes pin. Slip a piece of pipe cleaner for the antennae. On green paper cut out leaf shapes (long and oval), draw the veins with a black marker and then ask the children to glue a line of colorful pom poms on them to represent a caterpillar. Now you have a caterpillar on a leaf! Cut out circles from black and red paper (about 3" in diameter) and cut the red circles in half to make lady bugs. Use a large black circle on the bottom, glue 2 red half circles on that (on each side for wings) and a small black circle (1" diameter) for the head. Finally, ask children to dip their fingers into black paint and make dots!! Take all of these things and attach them to your garden. It's beautiful! Comments: This is a wonderful way to brighten up your class room! You can make it in the Spring or Summer and leave it up for quite a long time! This preschool art activity encourages young children to mix colors and to use a variety of different painting items. Materials: Large paper, yellow, white and orange paint. Painting items such as; brushes, swabs, feathers, fingers, etc. Directions: Talk about how summer means many hot days and what the sun provides them. Ask what color the sun is and let children choose the colors they would like to use to make their sunny pictures. Comments: They love mixing colors with the different items and their fingers! 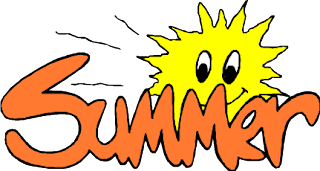 While introducing this summer puppet project to preschool children this is what you can say; "Summertime means lots of sunshine. We love it when the sun shines and we can play outside. The sun makes us feel hot sometimes and thirsty. What else can the sun do? It can burn you too! Please remember to wear sunscreen." 1. Trace children's hand on the colored paper. You will need to cut out five yellow hand shapes and six orange hand shapes. 2. Children paint the bottom of one paper plate yellow. 3. Children cover the bottom of the second plate with glue. They arrange the hand shapes around the edge of the gluey plate for the rays of the sun. Teach patterning, by showing them how to glue first an orange hand, then a yellow, then an orange, etc. ending with an orange hand, and leaving a 2 inch opening between them where no hand "ray" sticks out. You can draw a line for them to see where to place the first hand and where to stop with the last hand. 4. The children put the top of the painted plate over the gluey plate so that you have a yellow sun with rays all around it. The opening will be the bottom. 5. To make the mouth, push the two paper brad fasteners into the sun above the opening and about 3 inches apart. Hook an end of the rubber band over each fastener. Open the fasteners on the back of the sun to secure them. Children will need help or the teacher can do this part. 6. Cut two eyes from the white paper. Children use a black marker or crayon to draw a pupil on each eye. Children glue the eyes to the face of the sun. 7. Children cover the tube with aluminum foil. Fold the extra foil down into the two ends of the tube. Cut a 2 inch slit on each side of the opening at one end of the tube. Help the children slide the bottom edge of the sun into the slit. 8. Tie one end of a 24 in. length of yellow yarn to the bottom of the rubber band mouth so that it hangs out. To make the sun puppet look like it is talking, just pull on the end of the yarn. WHAT DOES YOUR SUN WANT TO SAY? Comments: The children loved their sun puppets! They loved the painting and hand prints, and especially making their puppet's mouth move and "talk". This activity helps the children understand the concept of patterning while still allowing each finished product to look individual or different. Directions: Give each child a paper plate middle. Have the children "paint" the circle with glue and then decorate with the tissue paper. Allow the circles to dry while explaining patterning. After the circles have dried encourage the children to make patterns with the colored triangles by gluing them around the outside of the circle. Easier patterns for the younger children (ABAB pattern) and harder patterns for the older children (AABB pattern, ABBA pattern, etc.). children color the paper plate anyway they want. Then glue a Popsicle stick to each top corner of the square. and then to the paper plate. It looks just like a hot air balloon when it is done. Directions: Let the children color the half of one paper plate and the rim of the other. When they are done, you will need to cut the rim out of the paper plate and discard the middle section. This becomes the band for there head. You staple one end to the one side of the half plate then the other end to the other side. You will need to check it to make sure it fits the child. You might need to tighten it up a bit. Once you staple it. Take some tape and cover the staples. (Both sides) This way the children do not scratch their face and it is sturdy. We wore them when we went out to play that day. Need: poster board, Collage material, glue, scissors, and colored plastic wrap. Directions: Cut several eyeglasses shapes out of poster board. Set out collage materials and glue. Let your children work in small groups to decorate the eyeglass frames. When the glue is dry, attach plain or colored plastic wrap to the frames for lenses. Directions: Have the children paint large circles with yellow paint. When the paint has dried the children can draw faces with markers. Then have the children glue short yellow streamers around the edges of their sunny faces. Directions: Give each child a piece of white construction paper. Put a blob of yellow paint in the center of each paper. The children can use Q-tips to draw the paint out to form rays or give them a straw and they could blow on the paint to make the rays. Directions: Using the centers that you cut from the paper plates, cut the circle in half to make a straight edge. Have kids decorate and glue to a popsicle stick. Now you have a fan! Directions: Give each child a piece of white construction paper and a Q-Tip. Place a blob of yellow paint in the center of each paper. Have the children use their Q-Tips to draw the paint out from the blobs in long rays to create suns. Directions: Provide paper plates and markers. The children can make sunshine puppets. When they are finished, add a tongue depressor to the back of the plate with glue or tape. Cut out large surfboard (oval) shapes, put their foot prints on them and let them decorate!